Firefox ESR (Extended Support Release) is an official version of Firefox that doesn't come with the latest features, but instead focuses on security and stability fixes. These ESR Firefox builds are intended for organizations like universities, governments, businesses, and others who need mass support deployment. Firefox ESR releases are maintained for more than one year, and only receive point (minor) releases containing security updates, coinciding with regular Firefox releases. These Firefox builds are not only targeted at organizations, but also at individuals who prefer stability over new features, or who prefer a UI that doesn't change between releases and extensions that don't break upon upgrading Firefox. The latest Firefox ESR version is currently 60.3.0, released on October 23, while the latest regular Firefox release is 63.0.3. 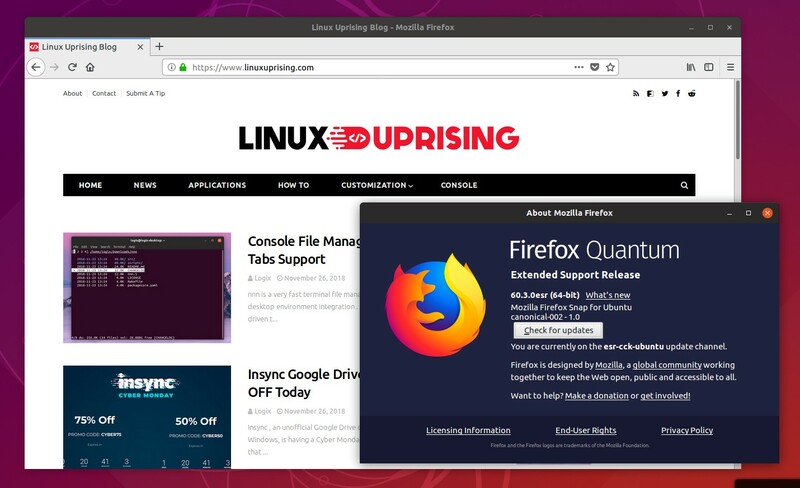 Since Firefox ESR is focused on security and stability, rather than new features, the next major version (68.0) will be released in September, 2019. For more about Firefox ESR, see this page. 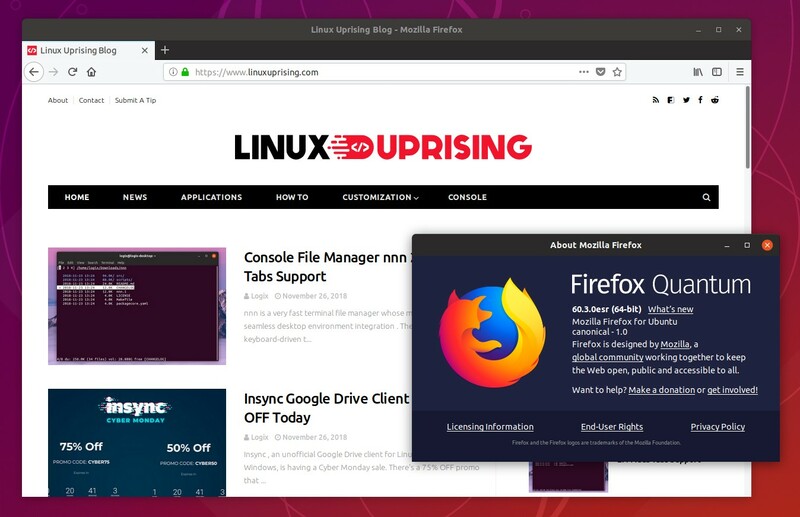 While Firefox ESR is not available in the Ubuntu and Linux Mint repositories, it's easy to install it in both, either by using the Snap Store or by using the Mozilla Team Firefox ESR and Thunderbird stable builds PPA. Using either the PPA or the Snap package to install Firefox ESR, your current Firefox installation will not be overwritten, so you can continue to use both the latest Firefox release, as well as Firefox ESR. Also note that using either the PPA or Snap package, a new Firefox profile will be used. You will get multiple Firefox entries in your application menu though, because Firefox ESR does not use a different name or icon in the menu. It's best to either remove the latest Firefox build from your system (you can remove it using: sudo apt remove firefox) if you plan on using ESR, or create a custom menu entry for Firefox ESR so you can easily differentiate between it and the default Firefox builds. There's also an unofficial PPA that contains the previous Firefox ESR version 52.9, in which legacy extensions (non-WebExtension API add-ons) still work, but this Firefox version is no longer supported, so it won't receive security updates. I'm not including instructions in this article for using this unofficial PPA due to the security risks related to using an outdated Firefox version. Using Firefox ESR Snap, the application will not use your system Gtk+ and cursor theme. If you want it to integrate properly with your system, use the PPA package instead of Snap. On Linux Mint I had to logout and login to get the newly installed Firefox ESR Snap to show up in the applications menu. The first time you run an application installed as a Snap, it may take a while until it starts - this should only happen the first time you run it. After installing this package, log out and in again to complete the installation. Ubuntu already has Snap enabled by default. For enabling Snap support in other Linux distributions, see this page. You can also use Gnome Software app to install Firefox ESR as Snap: search for Firefox, find the Snap package, scroll down and change the Channel from stable to ESR/stable, then install the application.